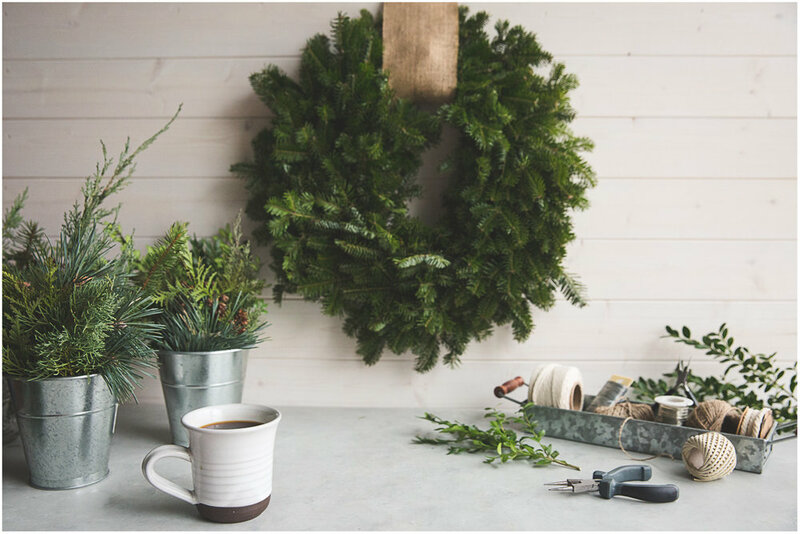 Making evergreen wreaths for the holidays is a long-standing tradition this time of year. It's one that I had always wanted to make a part of my life, but never seemed to get around to it. I thought it would be difficult, and when I first tried it nearly 20 years ago, I thought it was. But last year, after a fun adventure into the woods hunting for Christmas trees, my aunt sat down with me and showed me how it's done. She has such an easy air about her - she's not a perfectionist so I didn't feel like she was judging me the whole time, and at no point did I feel overly embarrassed by my ignorance of the whole wreath-making process. 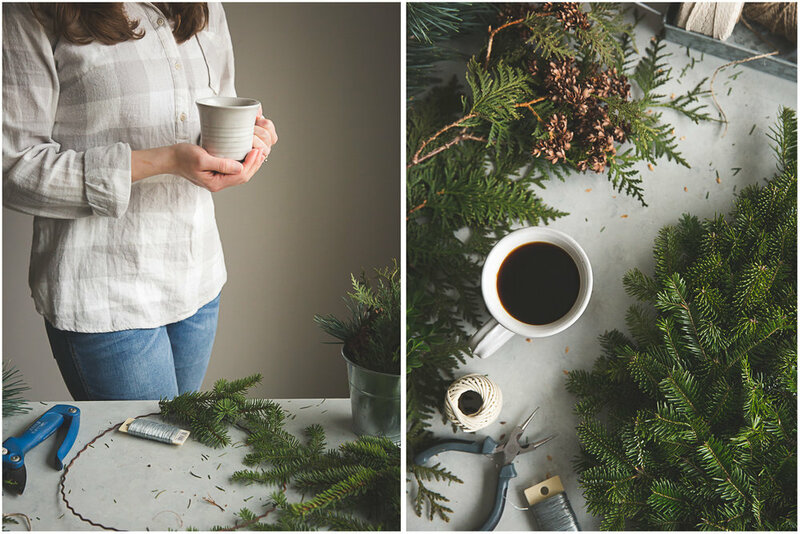 She made it fun and approachable and I learned to embrace the imperfection of the wreaths I made. This year I felt sufficiently confident to undertake wreath-making on my own. I used the boughs we cut from our own Christmas tree, clipping them into small tips that I could easily wire to the wreath. I used a simple metal form and some flexible but strong wire to assemble it. I placed the tips in groups of threes and wired them tightly to the form. At first, the wreath looked a little hopeless, but as I kept adding more greens, it started to shape up. It's far from perfect, but I'm happy with it. I topped mine off with some cedar and boxwood clippings, and burlap for hanging. What do you think? 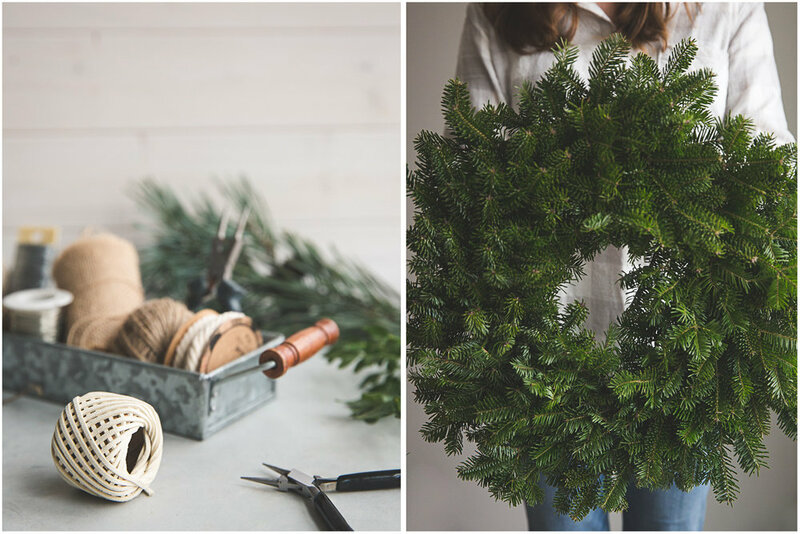 Any wreath-making happening in your household? Wishing you all a quiet and joyful holiday season.